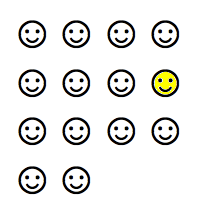 This year is just one example of a well established pattern. In a previous forum on “the future of Buddhism in a post-baby boomer world,” Asians were again excluded from the conversation entirely. 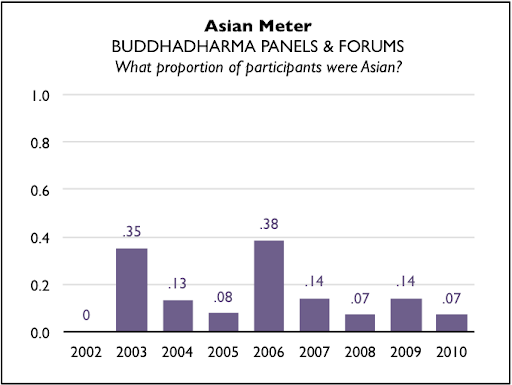 In fact, of the 34 panel discussions since Buddhadharma’s launch in 2002, Asian Buddhists landed a spot in less than half, averaging one or two participants per year. The only two exceptions involve a panel on prayer and a forum on Buddhism’s ethnic divide. Those last two exceptions amply demonstrate that Buddhadharma can achieve diversity—if it chooses to. One more forum or article on diversity will not remedy the problem. The solution to exclusion is inclusion. Rather than just report on diversity, Buddhadharma should lead the way. These thoughts might need some elaboration. In a typical year, Buddhadharma has four discussion panels (one for each issue), averaging about 14 panel spots a year (that’s three-to-four panel spots times four issues). Last year was one such typical year, where just one of these spots was allocated to an Asian Buddhist (Dzogchen Ponlop Rinpoche). A diagram might illustrate the starkness of this disparity. in the 2010 Buddhadharma forums. When every Buddhadharma forum was dropped into a graph, it became clear that most years were not much different than 2010 (i.e. one or two Asian participants). But two exceptional years stand out; in 2003 and 2006, Asian Buddhists occupied an otherwise unheard of number of panel spots. Nearly 40 percent! What could possibly have made these years so exceptional? A look into the details was revealing. The 2003 Buddhadharma forum focused on prayer (“Do Buddhists Pray?”), featuring three Asian Buddhist panelists. In 2006, a forum on ethnic diversity (“Diversity and Divisions in American Buddhism”) featured another three Asian Buddhists. These are the only two instances in the magazine’s history where Asian Buddhists comprised a forum’s majority. Importantly, when an “ethnic” topic arose, the editors successfully sought out “ethnic” voices. (Is “prayer” a particularly Asian topic? It’s complicated.) My takeaway is that Buddhadharma knows how to reach out to Asian Buddhists—they managed it twice—but that for the most part, the editors don’t make the effort to do so. My simple advice is for them to invite Asian Buddhists to participate in more discussions, and particularly discussions that don’t necessarily have to do with “ethnic” themes. Welcoming in the true diversity of Western Buddhism is not quite this simple, but I’d like to think it’s a good place to start.